Last week I shared my perspective on couponing, and I mentioned that I would also share how I keep my couponing under control. I will be the first to admit that "serious" couponing and bargain hunting takes somewhat of a time commitment. As I've mentioned before, I think of it as a somewhat of a part-time job for myself. However, I have two little girls under the age of three at home, and time with them is my first priority. Also, as my husband and I still share a car, I have to be realistic about how many errands I can actually accomplish each week. However much or little time they have, I think everyone eventually has to set some limits to their bargain hunting, otherwise they risk making themselves crazy or getting burned out. No one can take advantage of every single deal! It has really been helping me lately to set some "rules" for myself, so that I make the best use of my couponing time. Some of these were inspired by the example of other frugal bloggers (especially Crystal at Money Saving Mom), and others I developed purely through trial and error. Of course, everyone's rules will be different, but I hope these are helpful to some of you. 1) I don't cut out or file extra copies of coupon inserts. I get the Sunday Washington Post each week, as well as the Red Plum inserts by direct mail every Wednesday (since the Post no longer carries them.) Each week I try to cut out all the coupons and file them in my large coupon box. However, I also get an extra copy of the Smart Source insert from a local paper, and my mom and sister also send me extra coupons. For a while, I was always behind on cutting out and filing all the coupons, so lately I have cut back. I cut out and file one copy of each coupon, and just keep the my extra inserts and coupons. Before I shop, I try to go through my extra coupons and take out any extra copies that I think it's likely that I'll use. I usually have planned out my great deals beforehand, so I basically know what coupons I'll be using. Of course, I'm risking not having the extra coupons for an unexpected deal, but it's a risk that worth it to me for all the time I'm saving. 3) I don't do catalina deals at stores at which I don't regularly shop. This is an important rule for me because of my limited transportation. Catalinas, in case you don't know, are coupons that print at the cash register at the grocery store. A lot of the great catalina deals out there are store coupons for money off your next purchase, e.g. "Buy 3 products, get a coupon for $5 off your next purchase." Often these deals will make the original 3 products very cheap or even free, if you count the catalina, but that is only true if you actually use the catalina on something you need anyway. Basically, these deals always require a return trip to that store, usually within a coupon of weeks, since the catalinas usually expire quickly. That's fine if it's a store that I visit regularly, but not if I have to make a special trip. 4) I shop at CVS, but I don't do Walgreens or Rite Aid. This rule goes with the one above. Playing the "CVS game" and constantly rolling over my ECB's requires me to shop at CVS nearly every week. Walgreens and Rite Aid have simliar programs, and we have all three stores in my town. However, I quickly discovered that I could not keep up with multiple programs, so for now I am simply sticking with CVS. I would consider hitting one of the other drugstores for a really fabulous deal, but not one that would require me to keeping going back (i.e., a catlalina-type deal). 5) I try to step back and let go. Some weeks I don't get all my coupons organized and my shopping trip is somewhat chaotic. Sometimes I forget a coupon or the cashier makes a mistake. Sometimes I forget to take advantage of a deal or don't have time. Sometimes I am too late to print a really good internet coupon. At these times, I have to just step back and let go of the pressure. I save what I can, and I'm proud of the money I am able to save for our family. Missing out on one deal won't really affect our bottom line too much, and there will always be more deals to take advantage of in the future. 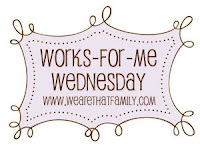 More Works for Me Wednesday tips are here. I totally agree with what you said! About 2 years ago I went crazy with going to CVS and Walgreens. I was spending so much time planning and organizing coupons it was kinda insane! I actually got burnt out very fast which was kind of a blessing. Now, I pretty much just stick to grocery shopping and Target. If there is some great deal at Walgreens or something I will go but I dont usually plan out any kind of trip. Great guidelines! It's so easy to get burned out. How do you get the RP insert mailed directly to you, though? We don't get a paper, so this is very intriguing to me! Great guidelines. It's so important to make your shopping work for your lifestyle. It sounds like you've got it down! My sister requested them, but she hasn't gotten them yet, so I can't confirm the results. I do Target and CVS, mainly b/c CVS is so close to my house and Walgreens are just starting to pop up that I don't even get their ads yet. I cut ONLY coupons I would/might use... I don't have time or patience to get great deals on things just to donate them. I do my fair share of charity work and funds, so I feel ok about this. I also get Red Plum with a booklet of ads, but I also subscribe to the Post (just Sundays) and live in N. VA.
As for mail-ins. I do it right away. I make copies of everything (UPC, receipt, the offer) and mail it. I keep the copies in a folder, and when I get the rebate, toss the copy. Its worked great for me, and is about the only thing I use stamps for anymore. I agree with much of what you've said. We skip mail-in rebates for the same reason, and I don't frequent Walgreens or RiteAid. My Walgreens store never seems to have the sale items, so it's a source of frustration, anyway! It's also in the opposite direction of CVS, which happens to be almost next to my supermarket. Easy choice, there. I'm so glad to hear someone talk about how you can't do EVERYthing with coupons! I get so discouraged when I read coupon/frugal blogs, because I just don't have the time or energy in me to do as much as I would like to. But what I keep reminding myself is that every little bit helps - something is better than nothing! i totally agree. i love cvs, but i've laid off for several months just to simplify my life. when i quit clipping/filing coupons in favor of the insert method i gained back about 4 hours of my life each week. i may miss a few deals, but my time DOES have a dollar value. i was just posting today about couponing with kids and you're right... the kids are the priority. it's all about balance and moderation!